Unless you are a celebrity or well-known media personnel or a famous blogger with thousands of followers, chances are that you will not have massive number of visitors in your blog as soon as you publish your new blog post. Then what to do? How to get those massive blog traffic? Which strategies are needed to attract massive number of blog visitors? You need to promote your blog, seriously and actively. You should NOT just sit and wait for visitors after publishing your new content. Even famous bloggers, such as, Neil Patel reiterated in one of his recent articles about the importance and steps to promote blog content. You need to reach out and let world know about your awesome post. In this post, you will learn 44 awesome ways to promote your blog posts to get massive blog traffic. The best is, all of them are highly legitimate and absolutely FREE to generate huge traffic. 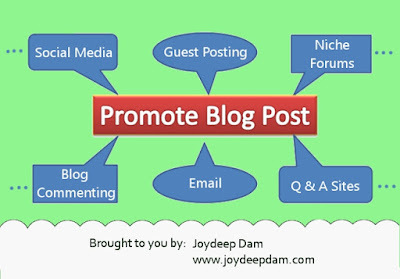 Where and how to promote your next blog posts to get instant and massive traffic? How to get more re-shares of your social media sharing? "Awesome" and "highly effective" methods on how successful bloggers or influencers will link to your content and share it to increase your blog's visibility and audience. Writing good and unique content is an art and choice. If you want your blog post to be shared, write it in such passion (and fashion) so that it will be worth shareable. Stuff it up with graphics to give it a great look. Carefully format the post. If you write a good post which delivers some value to your readers, they will eventually start sharing it. Send emails or tell your family members, friends, previous and recent colleagues (who share similar interests) about your new blog post. You can even extend to anybody whom you know well enough and has similar interest like you in the niche. Keep the email simple and small. Put your post title in the email body and create hyperlink to the post link. Finally it doesn't harm to ask them to spread the news about your blog post. And don't forget to place a "Thank You" phrase. This may sound to nonprofessional as well crazy to you, but let me ask you: how many emails you send in a week to different email addresses. Even if the answer is just 1, you have the chance to get 52 unique visitors in a year. Instead of putting a big link under your name, write few words (I try to restrict myself within 5-7 words) and hyperlink to your blog post link. I use this form of signature - simple and easy enough to create and maintain. My suggestion is not to place any adult related web links or promotional product links in your email signature. Make sure to have an RSS feed for your blog. Place an RSS feed icon, so that readers can subscribe to your blog. These “loyal” readers will be notified whenever you publish new post and come back to check. Feedburner is a free site where you can “burn” instantly your own feed. Notify your blog subscribers about your new post by email to get instant visitors. Here I am sending email to my blog subscribers about the latest post on effective blogging strategies. And I see some instant visits. If you are long time blogger, you may have set up email subscription in your blog. And if you are new blogger, I advise you to place an email subscription box. If readers find your blog useful they will subscribe to get update about your blog. Once you have a list of subscribers, send them email about your new blog post either using paid service (e.g. Aweber, MailChimp – free for first 2000 subscribers) or completely free service (e.g. Feedburner). Don't ignore your links from your already existing awesome posts. These internal links can help your blog's usability to your visitors and therefore, can bring more traffic. In addition, proper usage of internal links can improve your blog's rank in the eyes of search engines. The ideal examples of successful internal linking are sites like Wikipedia and Amazon. Both of them has more than 50 internal links in each of their pages and rank high on search engines. Simply, go through your blog or website. Check for relevant phrases inside any of your post whether you can place a link to your other post within your site. Try to place 3 - 5 internal links per post. If you are a new blogger and yet to have sufficient number of posts to create internal links, try to produce quality contents and then update your posts placing internal links. To give you an example (screenshot below), in my blog post on how to define blogging purpose, I placed an internal link to my other blog post on how to define killer blogging strategy. Keeps visitors in your site for longer duration. Organized (contextual) internal linking will increase your site's rank in search engines. Another very effective way to keep visitors longer in your site as well as provide value to readers. Put a "Related Post" or "Post You May Like" or "Top Post" plugin at the bottom of each blog post. OR, you can simply insert relevant post links just at the bottom of your your post, either in a table or bullet format. Prominent Indian blog BloggerIdeas has placed "You Might Like" section at the end of each post. Here in a post on SEO technique (written by inspiring blogger Sonam Chawla), there are 4 more relevant posts linked. This section helps the blog to retain visitors for longer time while providing value to them. Make sure you have social sharing plugins or buttons in the blog post. With social sharing icons under/above/sides of blog post, it is super easy for readers to share. And if you manage to place a sliding one at one side of your post (without interfering the blog post), that would be great. This will help readers to share from any position within your blog post. They don't need to scroll up or down to find share icons. The adage "A picture is worth a thousand words" is definitely true. Place compelling, attractive photos in your blog post and install/put social sharing options on There is big chance that your visitors will like your photos and want to share it. Social sharing buttons on photos make it easy. Adam Connell from Blogging Wizard uses social media sharing buttons on his blog pictures. This allows him to get additional sharing of his blog posts. Head over to Image Sharer App. You will be provided with an HTML code. Insert that code into the <head> of your website. Go to your site and click on the SumoMe badge (king's throne in blue box) in the top right. Sign up with your email to register your account. Click on the Sumo Store icon to browse and install image sharer tool (and many other free tools). Customize the social icons, display positions and other properties. According to Statista (online statistics portal), Facebook has 1.49 billion monthly active users in second quarter of 2015. If you are already in Facebook, chances are that you already have your family members, friends, office colleagues (some) in your friend list. Post your latest blog post and let them know. Customize your Facebook post - When you paste the link of your post, Facebook automatically detects and display any picture. If Facebook can not show any picture preview, upload from your computer a relevant picture. Customize the body of the post with few words on your blog post. Ask for LIKE, SHARE - A friendly request can go long way. With more than 1 billion active users, there are thousands (if not millions) Facebook pages and groups. If you are not already member of any group or page, use search option to find relevant groups or pages with more than 1,000 members. Next, check which of these groups allow you to share your post. Some are locked while others allow sharing. Don't start sharing immediately. You can be banned. Instead, first put some value by taking part into discussion, helping members. Share sparingly. Too much spices make a bad curry. Don't share only your content. There are lot of helpful blog posts on internet. Share those from time to time. This will create a good reputation. If you share your post publicly with hashtags on your profile or in pages, other users will find the post if they are also interested in same thing. If you have written valuable content, chances are that many people will visit and share your posts. These will bring mass traffic to your blog. Simply, type # in-front of the topic or phrase. I shared on my Facebook page about a guide on why and how to define blog purpose linked to my blog page. I use the #blogging as one of the hashtags. So whenever people will search about blogging, they will find my post. Hopefully I will get bunch of visits and if they like my post, chances are that they will re-share and new traffic will come. Put hashtags at the end in separate line. Don't flood your post with hashtags. Limit to maximum 5 hashtags. If you featured in your post any influencer or you have made a top list post with famous and popular people or businesses, you can tag them in your Facebook post. They will be notified. The post may also go on their profile and appear in their friends' or followers' news feeds.Chances are that the post will be viewed and shared by those followers, bringing traffic to your new post. Simply type @, then the influencer's name. Select the name from a drop-down list. I recently wrote about top 10 popular and money making blogs on Internet. I individually informed those blogs by tagging them (i.e. Mashable here for example). Do it sparingly, not to annoy the influencers. Only tag them if you are putting some value in your post. Don't just tag them because you have mentioned in a sentence. NEVER tag influencers/people in photos without permission (specially even if they are not in the photo). That's bad practice. 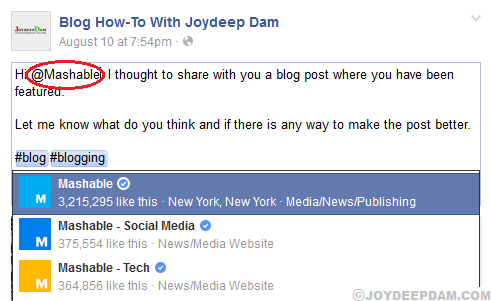 To promote any blog post, pin the post on Facebook timeline so that profile visitors will first see the blog post. This way you have higher chance of visibility and getting more traffic to a certain blog post. A fun (and effective if done correctly) way to increase audience and traffic, is to team up with bloggers in your niche and share each others content. That means, you share the blog post of another bloggers in Facebook in exchange for they promoting your post on their timeline/groups/pages. Share your blog post with link in Twitter. Twitter is a content sharing hot spot. With the limitation of using only 140 characters, it is definitely a challenge to create a great tweet which can get attention of others. You have only 140 characters, so be careful how to pitch. IMPORTANT: Attach a photo. This makes a tweet visually more appealing with the chances of more re-tweet. But remember attaching photo will also count as tweet characters. Check Neil Patel's 2 different tweets in 20 minutes apart. 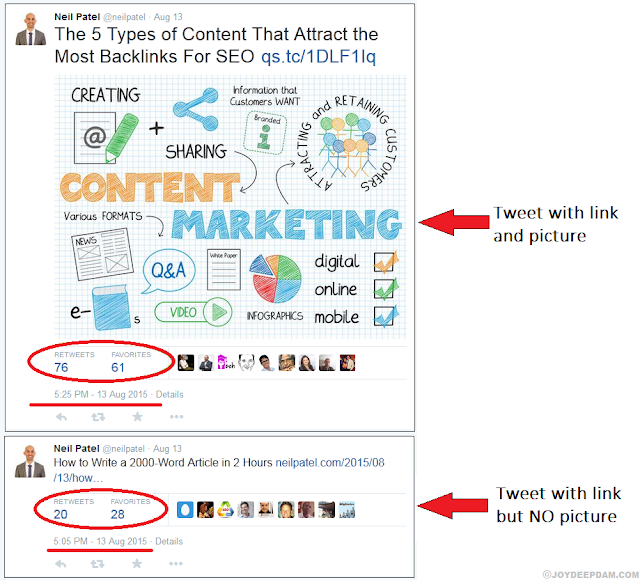 His tweet on content that attracts backlinks with picture got massive 280% increase in retweet and 118% increase in favorites compare to his tweet on how to write 2,000 word article without picture. 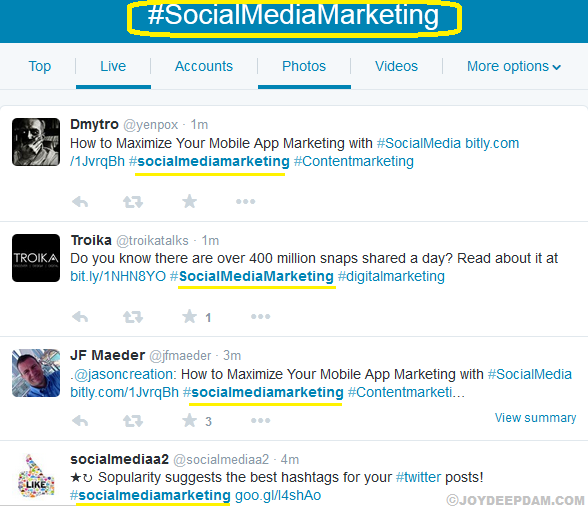 Just like Facebook hashtag, place maximum 3 hashtags in your tweet. Whenever twitter users search for a specific hashtag, they will get a list of most recent tweets containing that hashtag. If you featured influencers in your blog post, you can mention them using @ and influencer's username. Chances are that you get retweets and favorites from the influencers, which will bring new visitors to your blog post. Inspired by Brian Dean's awesome post on keyword research, Jason Chesters featured Brian in his own blog in On Page SEO Guide post. 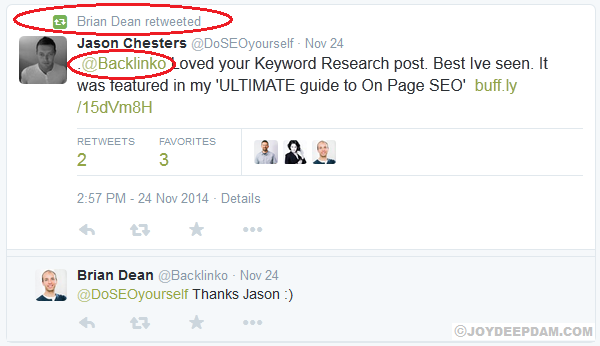 Jason tweeted his post, mentioning Brian in the tweet (@Backlinko). Result: he got a retweet and favorite from Brian himself. This increase visibility of Jason's tweet and definitely some visitors to his post. Pin the tweet with latest blog post on your Twitter profile to promote it. Pinning on top increases visibility and traffic to your post. Just the same idea as in Facebook post swap, you can team up with other tweeter in your niche to exchange tweets. This act is a win-win situation for both of you as you are helping each other to promote your contents. As of 2013, there are 540 million members in Google+. You can get some good amount of visitors from here. If you have never used Google+, Mashable has an excellent beginner guide for Google+. Create a good looking profile, a circle of your family, friends. If you want to post your blog post, make sure that you select "Extended Circle" and "Public" from the list of "To". This way your post can be viewed public, thus more chances of getting additional visitors. Once you published a post with link to your blog post, pin it on top of your profile. This is a great way to promote certain posts, which allows more visibility and hence more traffic. Just like Facebook and Twitter, you can place # symbol in-front of any single word or phrase to make a hashtag. Whenever someone search for the keyword, a blog post with respective hashtag will appear in search result, allowing more visitors to a certain blog post. However, limit hashtags in each post upto 3 to 4. Similarly as Facebook or Twitter, whenever you feature or mention influencers in your blog post, let them know by tagging them. Simply use @ or + sign infront of the name of the influencer. They will be notified and chances are that they will reshare. That will bring some additional visitors to your blog post. DiTesco in his blog post on social media tools, featured Adam Connell of BloggingWizard. He then tagged him in his Google+ post which linked to his original blog post. Adam favorited and reshared his post, which means, Adam's Google+ circle could see the post and DiTesco got more visitors in his blog. 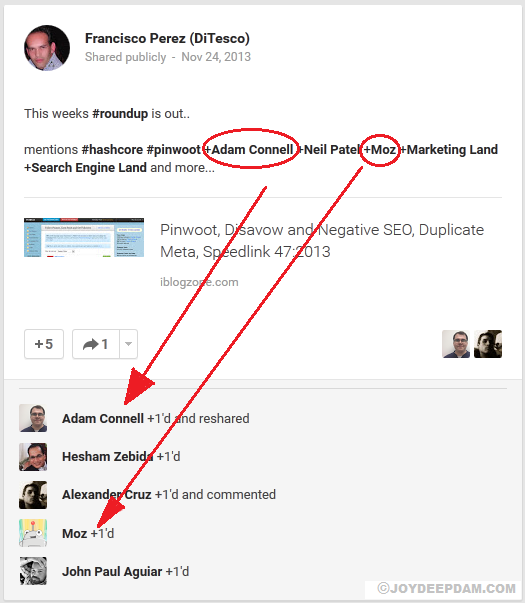 In Google+ you have communities where members share their posts. In Google+ search field, search for your niche specific communities. Try to find an active community with more than 5000 members and posts/shares by members everyday. 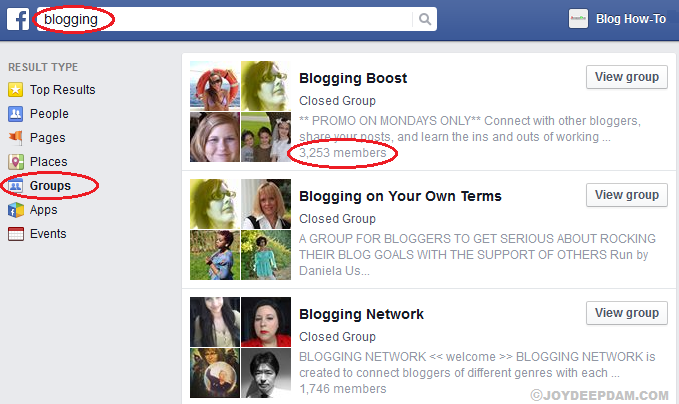 With an active community, you will have better chance to get your blog post seen by members. That will bring more visitors to your post. Instead of bombing with your blog post, first, build trust. Take part into discussion, try to help out members. Once you do these, you will be noticed. After that, every now and then share your blog post. Don't overdo, don't post SPAM. You will be banned and chances are that you can never get unbanned. Just like other social media, share also interesting and valuable stuff from other members. This way you will earn trust from other members. In Google+, there are large communities which have no owner or moderator. That means those are free to join and no rules and restriction for posting. Simply go to search option of Google+ and search with the word or phrase of your niche. From the community tab of searched result, find out which communities have no owner/moderators. Then join them, start posting and get traffic to your blog posts. LinkedIn is a great platform if you produce contents related to building career, leadership, marketing, achieving success. If you are in LinkedIn, you can share your blog post in your profile within your own network. Make your share with attractive images as well as customized texts. 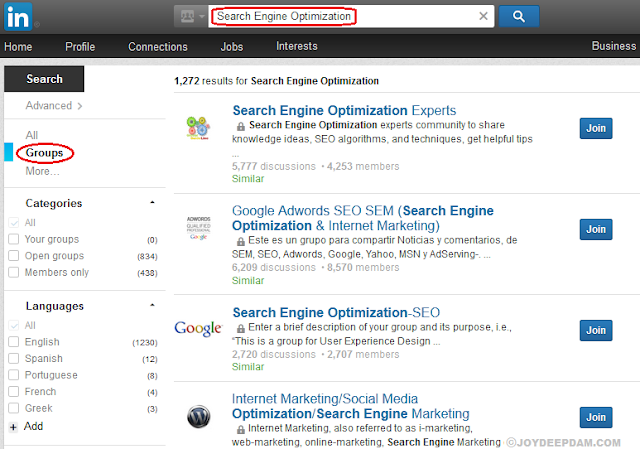 Use LinkedIn search option to find the groups in your blogging niche. You will find large groups in popular niches (e.g. SEO). You can filter the result by Categories and Languages to find groups you are looking for. There are groups which can be joined and post immediately, while others need moderator/owner approval. After you join a group, don't start immediately promoting your content. Introduce yourselves and contribute in some discussions. Otherwise you may get flagged and get banned. If your niche is either Fashion, Weddings, Decorations, Gardening, Photography, Crafts or anything visually appealing, you MUST be on Pinterest. In Pinterest, image is the most important aspect. So, make sure you share your blog post with an appealing and large image with customized texts. To start with it, sign up in Pinterest. Verify your blog/website with the method provided in Ponterest site. Create niche specific Boards. Start sharing/pinning image that will be linked to your blog post. If you are new in Pinterest and doesn't have loads of followers to share your posts with, don't get disappointed, as there is another legitimate way to promote your posts. Pinterest group boards are collaborative boards where the board creator and other board members share their pins. This means, as a board member you have the possibility to promote your blog posts in front of large audience without having a large follower base of your own. Read instructions and rules of the board carefully. Violation of those will bring permanent ban. Instead of promoting your blog from the very beginning, start as contributor. That means, pin other people's content, comment on the board pins. Once you have built up trust, share your best post with large and appealing picture with customized text. As you have gain trust from other members, your post will most likely get favorited and re-pinned, bringing some good amount of traffic to your blog. As mentioned earlier, placing social sharing icons in your blog is a great way to encourage visitors to share your awesome content. And it's very easy to place Pin It button on your blog. Or install SumoMe Share application, customize the appearance and position of your Pinterest share button. I believe below facts should give you adequate reasons why promoting your blog in Instagram could bring good amount of traffic. There are 300 million monthly active users. 70 million new photos are shared each day. There are around 2.5 billion Instagram likes every day. That is 8500 new likes each second. 1000 comments are left each second. Remember, photo is the KEY to successfully driving traffic from Instagram. Also make sure your website is mobile friendly as most users use Instagram from their mobile devices. You need to sign up from your mobile device. Create a complete profile. Insert interesting image with the a link to your blog post, customize description and a clear call-to-action to convince members to take a look to your blog. Just like other social media platforms, Instagram users can use hashtags to organize photos. Using hashtags, users make their pictures easily searchable. Use site like Top Hashtags on Instagram to research top, recent hashtags on Instagram . For every picture you post, include maximum 3 hashtags within your niche. As of August 2015, Tumblr has 230 million users. Tumblr is a heaven for image rich niches such as fashion, food, photography, dress, decorations, fancy cars. If you are new, sign up and create a Tumblr blog. Upload a compelling picture in your niche and put a link to your official blog posts in the "Source" field. Make sure to place 3 -5 hashtags so that your post is easily searchable. Tumblr has a good ranking and on top of that, it has a large internal users. So chances are that if your post goes viral, you will reap the benefit. Reddit is so far an untapped traffic hotspot. It's an online bulletin board, focusing on entertainment, social networking and news. Reddit ranks in the top 50 list of most popular websites. Reddit has sub-reddits in many different niches where members can submit content, such as text posts or direct links. There are popular sub-reddits which have thousands of active members at a given time. So these are the perfect places to post your blog link and get tons of traffic. However, I strongly recommend to get involved in the groups to get exposure and make credibility. Reddit members are very strict on self promotion. If you do it from the beginning or too much, your post will be downvoted and you may not be able to post anymore. You will get backlinks from quality sites in your niche. Backlinks from higher ranking and quality sites will improve your blog's rank in the eyes of search engines. Your website or blog will get targeted referral traffic. How do you do guest blogging? From searched results, contact webmasters or owners by email or their contact page. Ask them if they are accepting guest post at that moment. If they say YES, start writing your article. If NO, move on to next guest post site. Before submitting the post, proofread it carefully. Make a bio section with a link back to your site. This will appear at the bottom of the guest post, from where visitors can come to your site. Brian Dean's guest post about a guide on blogger outreach has generated 213 comments and 1,800 shares. In return to this epic post, he has acquired many new readers to his own site, Backlinko, including me. We like to be mentioned and noticed (in good way, of course!). If you have mentioned/featured other bloggers or influencers OR provided resourceful links to their blog posts in your post, make sure to inform them. You can either send them emails. Alternatively, you can reach them using tweets. Don't put all of them into one mail or tweet. Instead, email or tweet them individually. Your definitive guide on (referred blog post topic), inspired me to write an in-depth article on (link of your blog post) and I've included a link back to your post. Thanks to NicheHacks for this method! 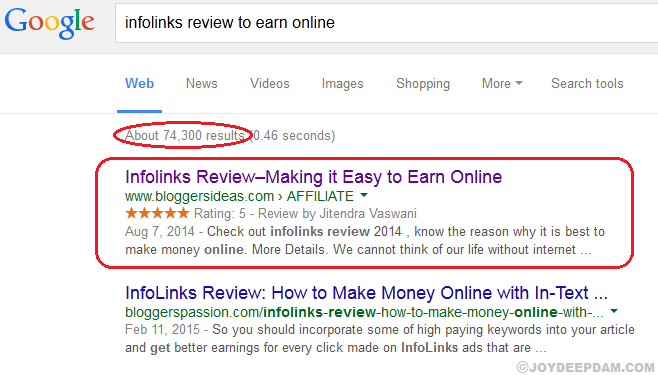 Search Google for the blog posts similar to your blog post. Head over to those blog posts and leave "meaningful" comment and a link to your blog post (in most of the comment sections you will find an URL box where you should put your relevant post link). Other commenters or visitors (together with site owner) will read your comment and chances are that they will visit to your post as it is also a relevant one. Targeted referral traffic to your site. I get some referral traffic from that site. In addition to that, you can see that I have an inbound link from that higher ranking site which builds domain authority. This makes positive impression in the eye of search engines and if you will have these types of inbound links your site will rank higher and get more referral and organic traffic. So, you see, if you can do blog commenting actively, you will get noticed more often by other people, bloggers in your niche, you have good chance to get new visitors.Your domain will have higher ranking and you will have better chance to get referral as well as organic traffics. Is blog commenting a smart strategy to drive traffic in your blog? Let me ask you: where on internet you will find huge crowd at a given time? If you don't know the answer, it is: Niche Forums. Niche forums are traffic hotspot. The large forums have easily more than thousands people online at any given moment, which can easily bring mass targeted traffic to your blog posts. How do you find relevant niche forums? Check the searched results for the interesting forums. You can either place your blog post link in your signature or inside a forum post to get traffic. You can add the latest link of your blog post in your forum signature. Whenever you reply or create a post, your post's link will be appeared and you get some traffic from the forums. For many popular forums, you can only do this if you are an active and useful contributor for some time. Take part into discussions, try to help out members. By doing this, you will create your credibility. Then, when you write a good blog post, share it in forum post giving as a summary and a link back to your original post. No doubt, our eyes are immediately attracted towards rich multimedia, such as, animated pictures, infographics (information graphics) or instructographics (instructions provided as graphics). Choose a topic. Be creative and make an visually appealing unique infographic. Or if you have instructional guide, make an instructographic instead. I was reading in your (site name) for some time and found your post on this (topic name). Real good stuff! I just published an infographic on this (topic name) which I think you'll like. Let me know if you want to check and if like it, want to publish in your site. I can write a mini guest post around the infographic for your site. If they agree, with your awesome graphics you can land some good backlinks from high quality sites. Video, more than other visual mediums, can attract our attention and emotion. So, if you want your blog post to be noticed, think about creating video teaser of your upcoming posts. Upload it to sites like Youtube, Vimeo, Dailymotion. These video uploading sites have huge internal audiences, rank high in search engines. You can either film yourself or ask any friend who would like to do for you. Or, you can create animation or whiteboard videos. Quora is a Q&A community with more than 90 million monthly visitors as of July, 2015. Head over to Quora.com and register yourself either with your Facebook, Twitter account or sign up with email. Then search for the questions in your niche or the topic you have published in your blog. Finally post meaningful and good answer with a link back to your post. Instead of just copy texts from your post, provide 2 to 4 paragraph answers with your thoughts and tips. This type of answers provide highest value to the community and members reward them by upvoting the answer. That allows the answer to come in front of the large audience and you will have more referral traffic into your site. Same as Quora, Yahoo Answers also has a huge community where questions from many different niches are asked and answered. If you are a registered user, head over to answers.yahoo.com and sign in. Otherwise sign up to Yahoo. Then search for questions in your niche and blog topic you have written. Provide some insightful answer with tips. Finally, place your blog post link into Source field. 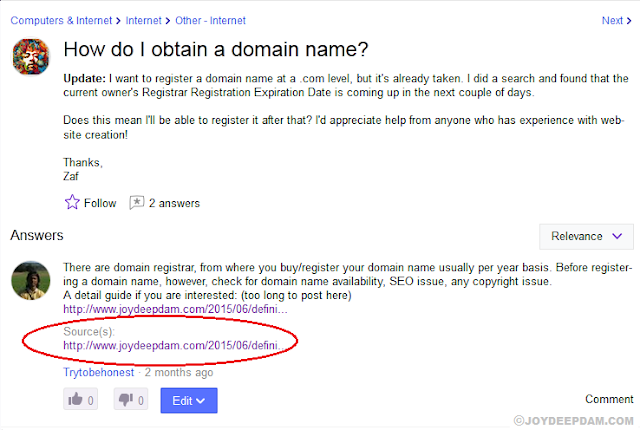 As an example, I answered a question on how to get a domain name. Then I put a link from my about the definitive guide to register domain names. If members will like your answers you will be upvoted and get referral traffic from this large community. HARO is the short form for Help A Reporter Out. You help out a reporter to write a short article (sometimes maximum 200 words), your tips will be featured in authority news sites, you get backlinks and traffic from authority sites. You'll receive 3 emails in your inbox everyday, 1 in the morning, 1 in the afternoon and one in the evening. 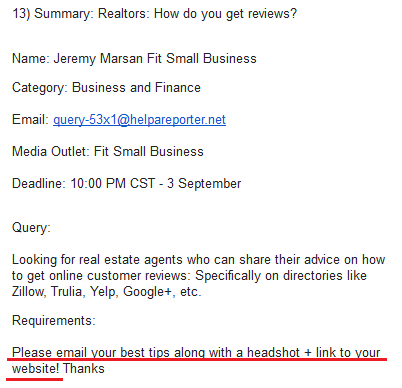 Respond to the email with your tips and links to your site. You will help a reporter and in return you will get awesome backlinks from authority and high PR sites, bringing you mass traffic. ... to put these killer strategies into action. I hope you have learned something from my post that took me nearly a month to compile. But more importantly, I want you to be successful and that's why I want to see you to take action. When you take action, you’ll be excited to publish your content because you know it’s going to work well. But just before you start writing, I want to know what you think about these strategies. Have you ever tried these strategies to promote your blog content before? How did it work out? These are some great tips. I used to share my website's content on Rediit, Twitter and G+. Thanks for sharing all these platforms.